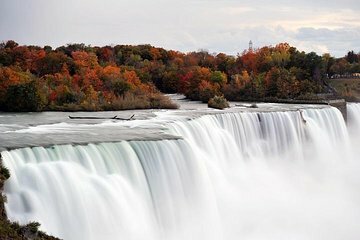 Experience East Coast highlights on a 5-day tour from Boston to Newport, Hartford, New York City, Philadelphia, and Niagara Falls. Pre-booked accommodations, transport, and a hand-picked itinerary mean you can relax and enjoy the ride to sites that explore American history, art, nature, and more, taking in views of New England and the Atlantic Coast along the way. To start out with the positives, the guide was nice and the driver drove safely...thats about it. There was very little communication prior to the tour and my questions weren't really answered, possibly due to a language barrier. We were picked up late and the bus was extremely packed. The windows had gunk on them so it was quite hard to see the countryside and impossible to take pics from inside where I was placed. We were supposed to get a different bus the 2nd day, but we didn't until the 3rd day. It was extremely cold on the bus and the days were so jammed packed that one gets little sleep on this tour, especially with the long check-in process at hotels due to so many people. The biggest disappointment was that most of the sights featured were just quick stops to take a picture from wherever a place to pull over could be found. It was also hard to hear the guide with so many people talking, and make note, this is definitely a family tour with lots of small children aboard. Some things you can't opt out of and end up paying for regardless, like the NYC tour, which if you're on the bus, then you will be paying for. The toilets on the bus were not to be used either. Very little commentary about stuff we were driving by, mainly just when we arrived at the main sites. The fees really add up on this too and I didn't even take part in most of the activities. This was an extremely ambitious itinerary, most of the time was spent on bus travel. The places visited were given short shrift, not enough time or interpretation was afforded them, particularly since the greatest proportion of the tour group was Oriental and not familiar with the importance of the places we visited. The guide's English skills were limited as were her explanations of the importance of our stops. Accommodations were in some cases dreadful, particularly those in NJ. Since there were so many Chinese, including the guide, we were taken to Chinese buffets for three of the five dinners. Too much! The tour guide Jason seemed more concerned with getting from place to place and did not seem very committed to the well being or comfort of the travelers. In Washington DC we arrived at the Lincoln Memorial, the Korean Memorial and the Vietnam Memorial and he said we had 15 minutes to visit the three memorials. I asked for more time and I had to beg for 5 more minutes. He gave us 30 minutes to go to the air and space museum. He thinks we just want to take a photo and go to the next place. The Edison Hotel in New Jersey was a zero star hotel in my opinion. It was dirty, smelled of perfume, the bed crunched when I sat on it, the phone didn't work, the carpets were stained, the curtains were askew and it was noisy. One hot day the bus broke down. We spent 61/2 hours at Wendy's waiting for a new bus. We got one bottle of water as we boarded the new bus. The tour guide could not understand why we would want compensation for our discomfort and loss of our experience at our destinations for the day. I did not know the trip was going to be in Chinese and English. I will never go on another bus tour again after this hell on wheels trip. Attractions were excellent. Accommodation was okay. Tour guide was very knowledgeable and helpful.